Apple retail channels this week started sales of Spire Health Tags, small, machine-washable devices with a long battery life that sticks to a user's clothes to monitor heart rate and track steps, breathing, stress levels and sleep patterns. Spire, a company focused on the development and sale of health tracking devices, claims its Health Tags are the easiest way to monitor and manage sleep, stress and activity. The small, gray devices are thin enough to fit on the inside of most clothing items, including bras, underwear, pants and pajamas. An optical sensor embedded on one side of each Health Tag makes contact with a user's skin to monitor heart rate, while motion sensors within track a variety of metrics. An accompanying iOS app ingests and translates raw data from the tracker to inform users of daily activity and stress levels, sleep quality, breathing and more. Notably, the hardware/software combo identifies moments of tension by tracking breath patterns. Users are informed of heightened stress levels and presented with tension-reducing breathing exercises. "Continuous health data will revolutionize health and wellness globally, but early incarnations have been hampered by poor user experiences and a focus on the hardware over the outcomes that the hardware can create," Spire founder Jonathan Palley told TechCrunch. "By making the device disappear', we believe Health Tag is the first product to unlock the potential." Unlike other health trackers, Apple Watch included, Spire's product is designed to be unobtrusive. The company claims users will not feel the tags during everyday use, a necessary feature as they are designed as a semi-permanent solution. Tags are applied to clothes via an adhesive that sets over time, meaning they effectively become part of a host garment. The tags are hypoallergenic, washer and dryer safe, and include a battery that lasts a year and half. Health Tags build on Spire's first product, the Stone, which launched in 2015 with the promise of tracking stress levels by measuring breathing patterns and activity. Apple is selling Health Tags in packs of three, six or eight for $130, $230 and $300, respectively. 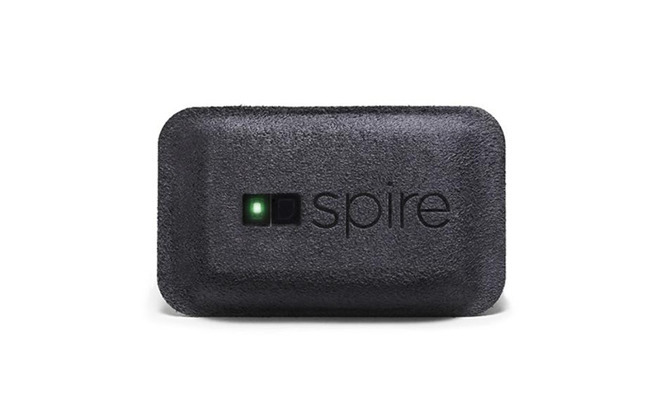 Spire also sells the tags directly through its website, with a single tracker going for $50 and packs of three and eight sold at the same prices offered by Apple. Spire is currently running a promotion, however, that takes $100 off an eight-pack, or $30 off a three-pack, when purchased with a $10 per month Spire+ membership. The membership includes free replacement Health Tags when batteries run out, 50 percent off additional Health Tags at $25 each and personalized health reports.